We are pleased to bring this new analysis to everyone’s attention because we strongly believe the bears and the shorts are in for a wild ride throughout the rest of 2018. Our research team, at www.TheTechnicalTraders.com, have gone over the chart using our advanced predictive and price modeling tools and we are going to show you why we believe the ES could rally +400 points or more before the end of 2018 – leaving the shorts/bears wishing they had read this research. Before we get too carried away, we need to highlight one thing regarding the current price setup we are illustrating with these charts. A “Price Anomaly” has setup because of this deep October 2018 price correction. This move has resulted in many industry researchers calling for further downside price action as they fear the beginning of a far deeper price decline in the future. We believe this conclusion is absolutely false. The price anomaly is the result of effective price rotation within volatility ranges that are acceptable to continue the current upward/bullish price trend and our modeling/research applications are suggesting we are about to see a +400 point rally in the ES (+11% or more; likely targeting 3100 or higher). Let’s get into the charts and the data. First, our TT Charger price modeling tool on an ES Weekly chart shows how volatility and price work hand-in-hand to create acceptable ranges of price rotation while still maintaining price trends. 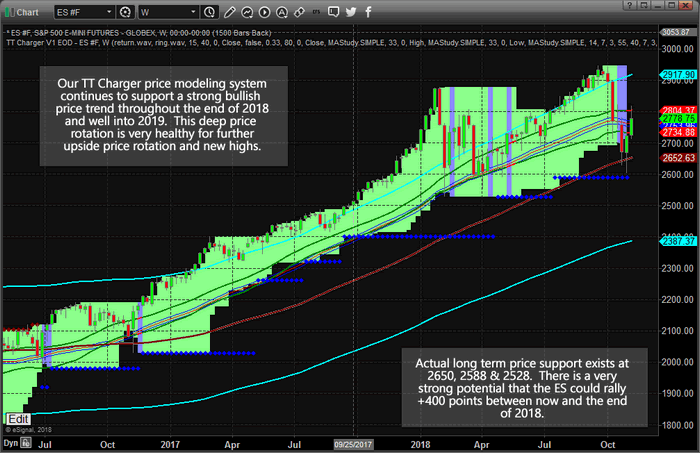 At this point, on the hard right edge of the chart, we can see the Oct 2018 deep price rotation fell to near our support levels (near 2650 & 2588) before rebounding higher over the past two weeks. Within this type of Price Anomaly setup, it is not uncommon for the price to “over-shoot” the targets before rebounding back towards the target levels. 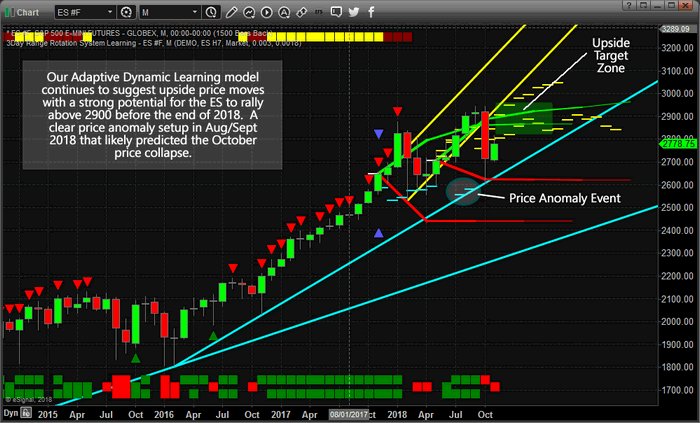 This chart showing out Adaptive Dynamic Learning price modeling system highlights the “Price Anomaly” event as well as highlights the upside price ranges/targets that we are expecting to play out over the next few months. Please pay special attention to the Aug/Sept 2018 price targets below 2600 that represent the Price Anomaly. When our predictive modeling systems identify outliers like this, it usually means there is a potential for a price anomaly event to occur. We call it a price anomaly event because the price may rotate and target these outlier areas in a broader price trend (in this case higher). This type of setup creates an incredible opportunity for skilled traders to trade the reversion price trend, higher in this case, after the price anomaly event is completed. As you can see from this chart, we are expecting the price to recover quickly to near 2900 with a strong potential for higher prices in early 2019. Before we continue, we want to share some data that supports our research and to alert you as to why we believe this upside price move could be dramatic and very profitable for skilled traders. One of the tools we use is a Probability Factoring Model while helps us understand what to expect in future price periods (Weeks, Months, Quarters). This tool helps us to understand if there is a predominant bias in price over a certain period of time or not. For example, it identified that October and November are typically very weak for Crude Oil and alerted us to the potential of falling oil prices in late September 2018. Right now, these are the results for November and December 2018. By reviewing this analysis, we can see that for the month of November 2018, the bias is clearly positive (17 bars positive vs. 5 negative; 3:1 ratio) and the upside price activity clearly outperforms the downside price activity (+751.25 vs. -266.50). Resulting in a +484.75 upside bias result. For December 2018, the results are equally impressive. A 4:1 upside bias ratio with a +420.75 upside bias result. Please keep in mind that these results DO NOT mean the ES is going to climb 900 points between now and the end of the year. What we can pull from these results is that there is a clear upside price bias for both months and that we should expect, roughly, at least 50% of this pricing bias to materialize. This means about 200~220 points in November and about 180~200 points in December – totaling about 400+ points overall. Anything beyond that would be considered an extended price move higher based on this research. Additionally, we would like to disclose that these analysis tools do not guarantee anything in terms of future price activity. We can’t attempt to guarantee any future price moves or activity based on our research. We simply attempt to use our proprietary tools to assist our members and followers in an attempt to stay ahead of these market moves so we can profit from them. It is our opinion that the markets are poised for an incredible upside price advance from the correlative and combined research presented by our proprietary price modeling and adaptive learning systems. It is hard to argue the facts that the price anomaly predicted this downside price rotation when we called this move on September 17th (nearly 45 days before it actually happened). At that time, we called for an “ultimate price bottom” to occur between November 8 and November 12. After that, we expected the markets to rally into the end of 2018 and well into 2019. You can read all of our public research by visiting www.TheTechnicalTraders.com/FreeResearch/. Our members are kept aware of these trends, rotations, cycles, rotations, and setups every day with our Daily videos and other research posts. Additionally, we issue very clear trade alerts to our members so they can take advantage of timely trading signals for profits. Get ready for an incredible end to 2018 and a fantastic 2019 by joining our other members in creating greater success at www.TheTechnicalTraders.com.